Kathryn! Thank you so much for doing this interview with me. You have been one of the earliest and the most persistent supporters of anniebloj, ever since I mentioned it as an idea last summer. Your Friday night texts of…”If ONLY there was a site I could go to to find out what was was going on around town tonight!! !” were always very motivational. I knew we would be friends as soon as you famously offered me a bite of your fried rice at Hop Alley, about 5 minutes after I had met you, after we both left the ATC Den opening party. You are an extraordinary business owner and you have built SO much in such a short amount of time. Thanks for squeezing me into your busy schedule. So… You are quickly becoming a leader in the beauty world, specifically within the Clean beauty market. Before opening Aillea, you were in sales and marketing at Vincent Longo. Have you always been interested in beauty and skin care? I have always loved skincare and makeup, but that was really amplified when I worked for Vincent Longo as I was able to put both the creative and the business side of my brain to work, which I loved. 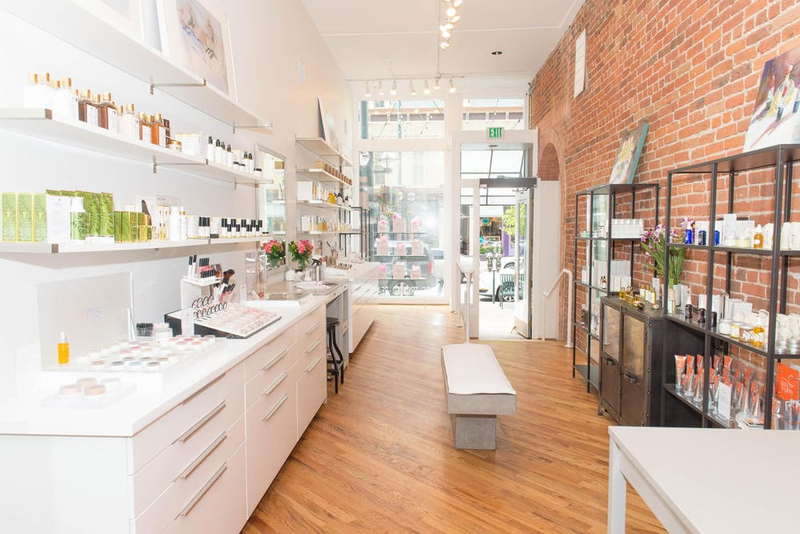 What made you decide to open up your own shop and focus on Clean beauty specifically? I came to clean beauty many years ago through personal health challenges. At the time, I was trying to clean up my personal beauty routine - there were no stores like AILLEA, where all of the products are toxin-free. When I started looking, it took me 3 months and $150 to find a shampoo that worked to my standards but had nothing bad for me in it. I thought nobody has the time or money I am putting in to this. The universes aligned for me to start AILLEA 4 years ago and I have never looked back. After you came up with the idea, how did you settle on the name Aillea, and what were the next steps in getting the business off the ground? AILLEA comes from the word Ailleacht, which is the Celtic word for beauty. When I was looking to name AILLEA I had a lot of people in my ear - some telling me to look at French names or Italian names or Greek Goddesses. Everything there was taken, and I also felt very disconnected from those words and names because I had no personal attachment to them. So I started looking in to my heritage. Because AILLEA is derivative of another word - not only did it mean something and look pretty - but I was also able to trademark it and protect myself. I was able to get the URL and social media handles too. You are famous for being incredibly stringent in your standards when choosing brands to carry, both in the formulations and in their presentation. Were these standards based on personal research or other standards? The formulation standards were based on years of research that is still ongoing and constantly evolving as new information comes out. The presentation standards are based on what I like, but more importantly what the customer likes. I have tried a few times to work with brands that have great product, but lackluster packaging, and the customers simply do not want to buy it. It feels as though Denver must have been the perfect jump off point to get this concept started. Has the reception been positive the whole time? How do you sway the skeptics? Denver has been an amazing market to start. Denver/Boulder are always named the healthiest cities in the country. We started off quietly, but have steadily grown since we opened and the reception has been so warm. It feels amazing when people thank us for having the store because finding these products has historically been so difficult. I honestly believe that to try the products is to love them, so swaying people is easy if I can get them to sample the products. Most never look back and are truly excited to find products that work so amazingly and have nothing bad in them. You have now two shops in Denver (Larimer and Cherry Creek), one in Atlanta, Charleston, and Raleigh with plans to open in Charlotte. It seems every time we get together, you are working on a new project. How do you keep up with it all and is your plan ongoing expansion? Much like a mom with kids, the endless hours doesn’t feel as much like work when its your own. Its definitely exhausting at times, but I also have an incredible team that supports me and works with me to help drive our initiatives forward. And much of what I do is for them as well. Everyone that works for me is motivated and really wants to grow, so for them to keep growing, AILLEA needs to keep moving forward. What do you like to do in your downtime, whenever you have some!? When we can steal away - you will find my husband, puppy and I in the mountains. Otherwise we love going to concerts at the Botanic Gardens, shows at DCPA or just walking around Cherry Creek for dinner! Have you found, like I have, that the creative community here in Denver is particularly supportive? I find that you have a knack for building relationships, particularly with the brands you carry. You also always seem to have such a great turn out for the events you host with the celebs of the Clean beauty business. Yes, yes and yes. I am so thankful to my brands and they have truly become friends. Its fun because we are all growing up tighter in the clean beauty world, which is VERY different from the conventional beauty world with regards to relationships. And I LOVE the creative community in Denver. I have been able to partner with so many amazing women, both brands from within the store, but also local bloggers, local artists, local wellness practitioners. There are true synergies to what we are all creating and it seems to feel so natural that we all collaborate. Favorite Food/ Dish to order: Wine. Just kidding (sorta) I love regional/seasonal food, so this is always shifting. But I am so excited for local colorado peaches right now. Favorite Podcast: I love mystery ones, like Serial, that make me think. Favorite Swear Word: All of them! I use them all on the daily. What advice would you give your 20 year old self? To have more confidence in myself. I think this is shifting, which I LOVE, but I think sometimes women don't think we are capable of leading. I was very tentative early on when starting AILLEA, but then I looked around at women I knew who were leading BIG companies - and I thought - I can do this. Thank you for sitting down with me and answering a few questions! This week, Aillea is hosting an exclusive evening with Clean beauty super star May Lindstrom. To RSVP, click though here. Kathryn and her team are exceptional at bringing the leaders in Clean beauty to her stores for only-at-Aillea experiences.